Today was the first of 2 days working with the Rotary Usula Club in San Pedro Sula, Honduras. We went into the clinic today at 8am expecting around 8 patients, and anticipating that there might be some we wouldn't be able to fit (sometimes people with above-elbow amputations come, even though the OpenSocket is only for below-elbow). When we arrived at the clinic, the lobby of the building was packed with patients waiting for us, as well as some of their families and friends. Dr. Luis, the Rotarian (and Orthopedic Surgeon) who organized the clinic for us, started working through our standard consent forms, while we jumped right into setting up our gear. Our plan of attack was for Jonathan to begin interviewing the patients, and then for him to sent them on to Dylan and I so we could conduct the fittings. The final step in our assembly line style process was for Ehsan to train the patients on how to use thier new device. Our first patient was a young man named Allan who had lost his arm in a machete attack. He came into the interview very depressed about his situation. As we worked through the fitting process with him, his face began to brighten, and when he opened the terminal device for the first time, a large smile spread across his face. Allan then began training with Ehsan, and very quickly picked up on how to use his new prosthesis. We kept moving efficiently through patients for the rest of the day, taking a brief break to eat some Little Caesar's pizza for lunch. Some of the cases we worked with were very ideal and straightforward to fit, while others were very tough. In several cases, our patients had very short residual limbs, but we were still able to get each of them set up with a well fit and functional OpenSocket. Some of the patients who had lost their arms many years ago had very low muscle tone in their arms. In these cases we made sure to stress the importance of practice to build up muscle. 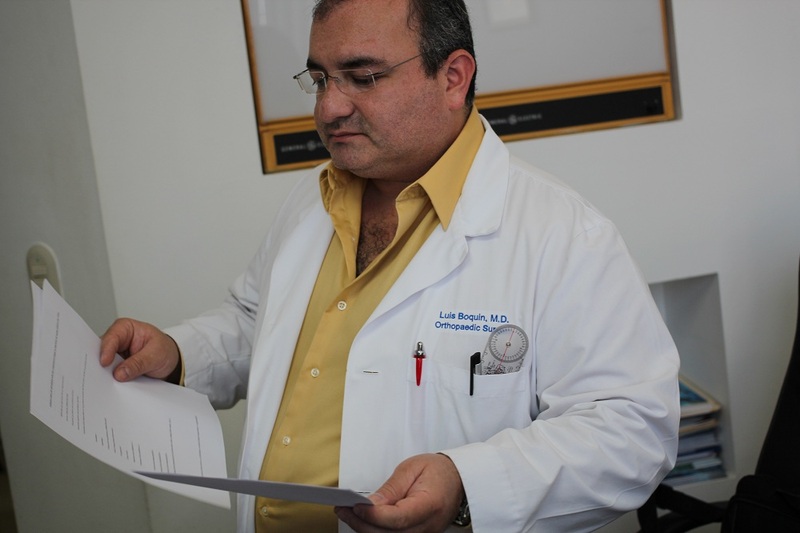 In the afternoon, we started to involve more of the Rotarians in the process, especially Dr. Luis. One of Dr. Luis's friends (a physical therapist) worked with Ehsan on the training as well. By the end of the day, Dr. Luis was able to fit 2 patients with almost no help from us! We we're very impressed with how quickly he was able to pick up the fitting process. One of the last patients for the day was a man named Roberto, who had lost both of his arms in a machete attack. Roberto's right arm had been severed above his elbow, and the amputation on his left arm was only a few inches below his elbow. His double amputation made it much more critical that we get him setup with an OpenSocket, but the high level of amputation on his left arm made fitting very difficult. After trying all 3 sizes of OpenSockets on Roberto, we were able to get him setup with a medium size OpenSocket. As he started using the prosthesis, Roberto had a huge smile on his face. He eagerly tried bringing different eating utensils up to his mouth, excited about being able to feed himself easily for the first time since his amputation. As we wrapped up the day, we asked all the patients to pose with us for a group photo. As we began to count the number of people, we realized that we had just completed 10 fittings in the course of one day! It was truly exciting to see so many OpenSockets in use in one place. These 10 fittings (one of which was was a new arm for an old patient) are the most Bump has performed in a single day! They also bring us to 18 total fittings on this trip, and 25 total OpenSocket users in Central America! We've got three more patients lined up for tomorrow, here in Honduras, and around 11 more potential patients in Guatemala and El Salvador over the coming week. Stay tuned.